Urban Land Institute and National Parking Association. If you want to add more parking downtown, or improve the operations of your current facilities, The Dimensions of Parking will be an invaluable resource. Each detailed section guides you through the process of developing and operating a parking facility. Key chapters focus on determining how much parking you really need, designing the most efficient layouts for lots and structures, estimating construction costs, and operating a safe and well-maintained facility. For more than 30 years, The Dimensions of Parking has been the reference that developers, architects, engineers, planners, and others have turned to for practical how-to information on the best practices for parking development and operations. Updated throughout, the fifth edition includes over 100 charts, tables, graphs, and photographs that highlight key points in the text and provide invaluable real-world data. 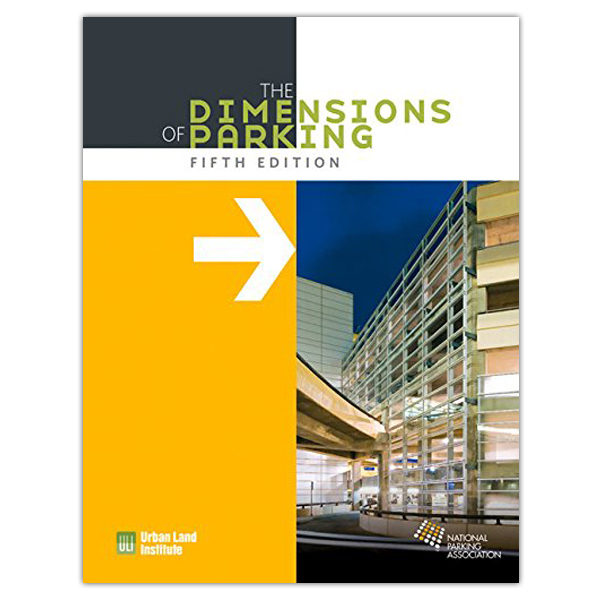 The Dimensions of Parking is the product of a partnership between the Urban Land Institute and the National Parking Association (NPA). It presents the expert judgment of the NPA’s Parking Consultants Council. The Council is a special professional group, within the NPA, composed primarily of engineers and architects who produce a broad range of technical publications on the design, construction, and layout of parking facilities. Dimensions of Parking is guaranteed. If you are not 100% satisfied, you may return it within 30 days for a full refund.